Direct push technology can drive sensors through the soil which send real-time data back to the surface, providing an immediate vertical profile of contamination. 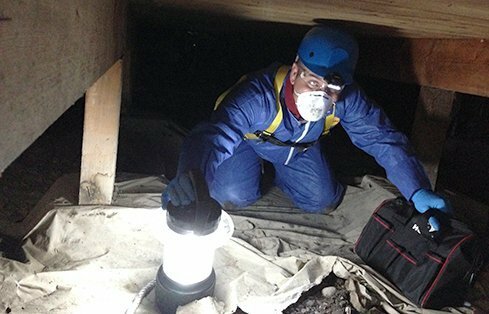 Aaron Waggoner prepares to deploy a Radiello passive air sampler in the crawl space of a home in the Palermo neighborhood. 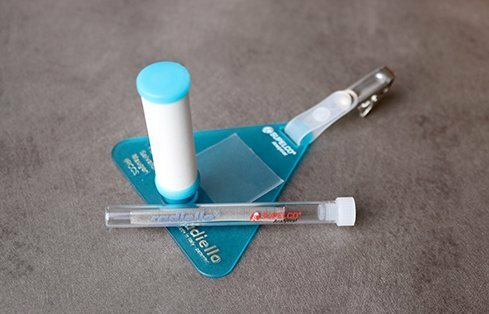 GeoEngineers’ indoor air test kits include a small, passive, non-mechanical air sampler that can be easily deployed to collect representative indoor air samples for the most common chemicals associated with vapor intrusion. Paul Robinette performing groundwater testing in a monitoring well at the Palermo site. GeoEngineers pumped out air from a rented home in the Palermo neighborhood in order to create a depressurized ‘worst case scenario’ in which to test for the possibility of vapor intrusion. Using cutting-edge technology to protect the public from underground contamination. The Palermo Wellfield is an underground source of drinking water for the City of Tumwater, Washington. The wellfield is situated near a residential neighborhood at the foot of a steep hillside, below a number of current and former commercial sites containing potentially dangerous contamination by chlorinated solvents. This contamination poses a risk to the Palermo Wellfield and the health of local residents. GeoEngineers is working to identify the scope of the contamination and measure potential threats to residents of the Palermo neighborhood. 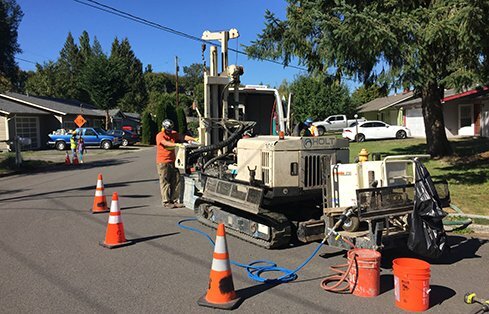 When City of Tumwater officials discovered chlorinated solvent trichloroethene (TCE) in the Palermo Wellfield’s groundwater, regulatory agencies began to investigate the source, magnitude and extent of the contamination in order to reduce public exposure. Upon investigation, Perchloroethylene (tetrachlorethylene) (PCE) was also found to be present in portions of the site. Based on the investigation results, the Environmental Protection Agency (EPA) designated the area, including the nearby Palermo neighborhood, as a Superfund site and began remediation efforts. The EPA was concerned that the TCE and PCE levels would present a potential health risk to portions of the city. The EPA found PCE emanating from a commercial site (a dry cleaning business) on the hill above the neighborhood and wellfield, including one operational and historical dry cleaning business. EPA tests also identified sources of TCE at two separate Washington State Department of Transportation (WSDOT) properties. EPA ultimately identified WSDOT as a liable party for the TCE releases. 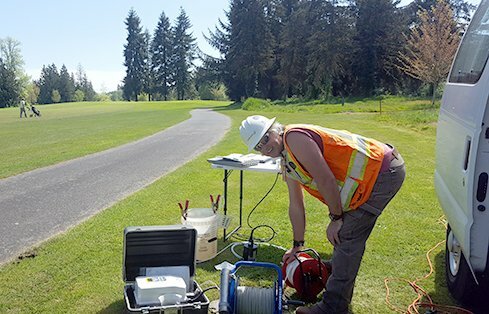 In 2013, WSDOT engaged GeoEngineers to continue monitoring groundwater and air to further characterize the nature and extent of contamination, assess health risks posed by these chemicals and eventually recommend additional remediation methods at the site. GeoEngineers is also monitoring remediation systems that the EPA already installed on the site, a subdrain and treatment lagoon to redirect contaminated groundwater away from the neighborhood. In order to evaluate remaining data gaps and potentially update ongoing remediation methods, GeoEngineers also recommended a newer direct sensing drilling technology to perform an assessment. A more complete data set will give a clearer understanding of the location and amount of TCE and PCE remaining at the site. TCE and PCE solvents may also pose a vapor intrusion risk—vapors can enter structures above impacted soil or groundwater and cause health problems. 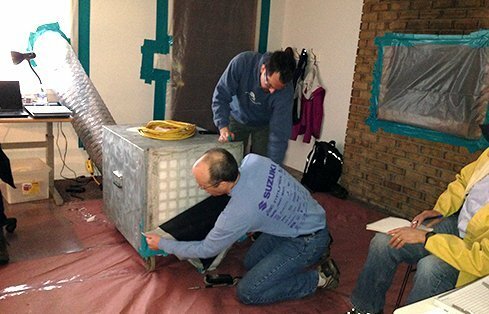 GeoEngineers used several air testing methods and worked with regulatory agencies to assess the air risk inside homes within the neighborhood. GeoEngineers has used several unique strategies to efficiently characterize the extent of chemicals of concern on the Palermo site. To assess the extent of the potential vapor intrusion threat, GeoEngineers has conducted a series of individual air monitoring events over the past 3 years utilizing passive air sampling devices to measure airborne vapor contaminants in private homes within the neighborhood. Based on our experience with the above air monitoring events, our team assembled an innovative, mailable air test kit that could allowed residents within the neighborhood or at other contaminated sites to accurately test their indoor air on their own schedule while reducing privacy concerns. GeoEngineers rented a house within the neighborhood to use as a ‘control’ air testing location during regularly scheduled air monitoring events. In order to get even more information related to vapor-intrusion risk, GeoEngineers created and performed two separate air depressurization tests in the rental home to create a ‘worst-case’ scenario in which to test vapor intrusion. The EPA provided a near real-time mobile air sampling device to evaluate vapors entering the rental home. Even in these ‘worse-case’ conditions, GeoEngineers demonstrated that conditions would likely not exceed unacceptable health risks for residents. These air depressurization tests are the only known air tests of this type to be performed on northwestern Superfund sites to date. GeoEngineers proposed a data gaps assessment using High-Resolution Site Characterization (HRSC) in transect orientation across the site. This method utilizes a combination of direct sensing tools to provide high-resolution, real-time information on subsurface conditions. By combining data from these tools with an electronic database and graphic visualization software, we will be able to construct a three-dimensional map of the explorations to fill in remaining TCE and PCE data gaps, and further the understanding of underlying geologic/hydrogeologic conditions. 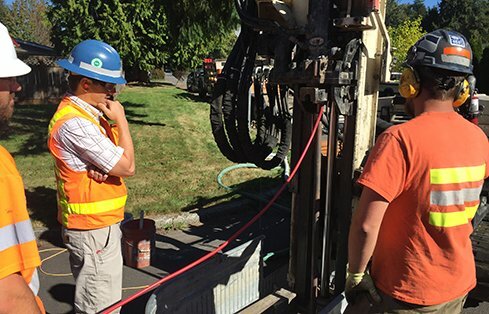 GeoEngineers’ work for WSDOT at Palermo is ongoing, and long-term environmental monitoring and remediation is expected. The data gaps assessment is expected to provide a significantly improved characterization of concentrations and locations of PCE and TCE in groundwater and soil at various locations throughout the site.